A very friendly community local which welcomes all guests who enjoy real ale. Although Ivor is a lager drinker, this has not stopped him since it became a freehouse to offer at times four pumps. The beer is alwys immaculate and he takes great pride in looking after it. Saffron, Buntinford, Black Sheep, Oakham, Tring, Crouch Vale breweries I have had recently. I have no doubt that its range of beers will continue to grow as word gets round of this little gem. 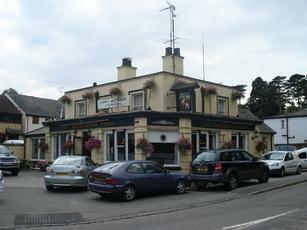 A great 'locals' pub; two bars and a small patio area at the rear. The bar to the left is normally the louder with tradesmen letting off steam after clocking off early to shoot pool or watch foot�y. The right/front bar is normally quieter. Landlord & Lady are �gems� � welcoming and friendly. Normally they have 2 good real ales along with a guest ale. The Bricklayers has dropped GK IPA: now the two permanent real ales are Saffron IPA and Black Sheep (each �2.90); there is a also a rotating guest beer (�3.00). Well worth a visit if you're serious about real ale. Went in for a pint after taking a photo but all the real ales were off except for vile Greene King's IPA. So left and went to the Half Moon instead! Went here on a monday evening. No food served, which was disappointing. It had posters up for pizzas, but that might have been lunchtime only, though this was not mentioned on the poster. It had a good outside smoking/decking area, but lacked character inside. Too modern and bland.